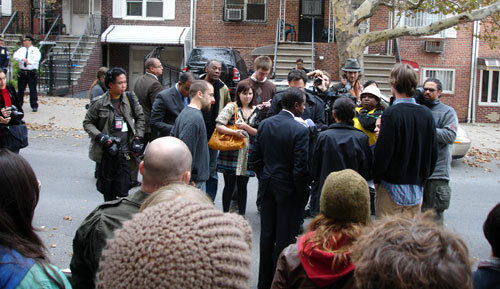 Many residents and a solid contention of the local news showed up to the press conference this morning at 1717 Troutman, Ridgewood, NY. The press listened to our concerns, that we have been inproperly dislocated. That we were forced to leave our homes and studios with no notice and that we have been left homeless and with very limited time to remove our belongings. The Democratic minority leader, Senator Malcolm Smith was present and promised to advocate on our behalf to grant us more time to properly vacate our buildings and perhaps to even return to our homes. The city of New York does not force residents out of commercial buildings, even when the commercially zoned building is used for private residence. Afterall, NYC has a long history of artists living in industrial buildings. They are generally the first wave of gentrification for industrial areas. Various stories are swirling as to our position. The city has requested for our landlord to take the keys to the building, but he doesn’t wish to be responsible for securing the building. When the landlord has tried to enter the building he hasn’t been allowed to, so we the residents, do not know what will happen to our homes and belongings after Sunday, the final day that the Department of Buildings has given us to remove everything. Many of us simply can not do so. Meanwhile, we pack and move the belongings that are most important to each of us, and hope that we will be able to return for the rest of our things. Brooke and I continue to stay with friends, uncertain of whether we should be looking for an apartment or keep hope that our homes will be returned to us. Senator Malcolm Smith (State Minority Leader) showed up and issued a statement to the Press expressing his support and letting them know that he came to stand beside us and support us. He stated to the media that he made a call to Mayor Bloomberg personally this morning to ask that he help the tenants that were displaced from 1717 Troutman. Congresswoman Catherine Nolan sent a representative who distributed a statement to the Press from the Congresswoman also expressing her support and petitioning the city for more time on our behalf. Chuck Delaney also showed up and spoke to us and offered us assistance. We had press from so many outlets including Daily News, New York Magazine, Channel 9 News, NY1, Univision, Ridgewood Times, Brooklyn Courier etc. Following a stay of three weeks in Mexico City to complete a commission for a museum in the historical center and staying in a nice hotel and being treated as a respected guest, I returned to New York City to be homeless. My residence and studio are located at 1717 Troutman in Ridgewood, a corner of Queens. The building is zoned for commercial use and I moved in nearly four years ago, since my previous building, a beautiful 19th century industrial brick building was to be demolished for the construction of condos. As a working artist and professor who needs a wood shop and studio, I have little recourse but to take a lease in a commercial building. The rents in New York City, a city that prides itself for its cultural relevance, are too too high for artists. The DOB informed the landlord, the man who has not brought the building up to code and claims that it is the responsibility of the landlord to inform the 220 tenants. This strikes me as incredibly irresponsible of the city and the DOB. 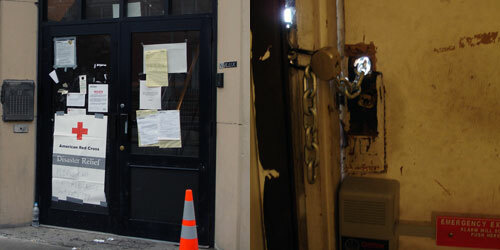 On October 18th, the DOB pasted VACATE NOTICES on every door of the second and third floor. Just as easily the DOB could have slipped notices under the doors weeks in advance. Instead the DOB left us at the mercy of landlord who is seeking to make a profit on his building. 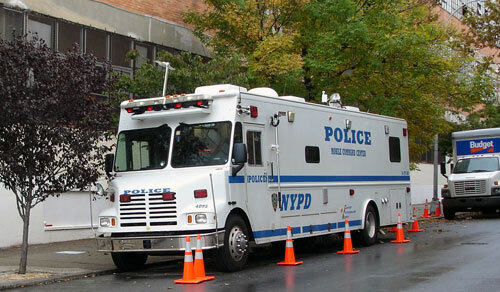 Now there are 220 tax paying individuals, residents of New York City kicked out of their homes with a 10 hour notice. One would not expect for this to happen in the United States of America. The Red Cross was informed, Animal Shelter was informed ahead of time. Residents were offered up to two nights at a Red Cross shelter. Initially the DOB gave residents one week to remove their belongings and only 4 hours a day to do so – 10am-2pm. Fortunately the hours and days have been extended. However my wife and I just got back from Mexico and we have to work and there is no way that we can get out of this building by Sunday October 28th, we have nowhere to go to or to take all our belongings. This may seem minor compared to the fires in California, but that is a natural disaster, our lives have been turned upside down, when it could have been avoided if people had been properly informed. Meanwhile there is a business on the second floor, a company that has not been given a vacate notice. They have been granted 30 days to bring their part of the building up to code. Why are individuals being treated differently than this company?! This is the same company that blew the whistle on our landlord, a company that was in a lawsuit with our landlord. So there are 220 citizens paying the price for a conflict between our landlord and the company on the second floor. Meanwhile the city states that it is acting to protect us, because the building is dangerous, it does not have a second exit or functioning sprinklers. Problems that can easily be fixed. The city is acting to protect us by kicking us out of our homes and putting us on the streets with only a 10 hour notice on the morning of the day we were to be thrown out. Now we do not have enough time or the means to move out. The residents of 1717 Troutman will have a press conference FRIDAY, October 26th at 10am in front of the building to state that we are homeless, we were not given prior warning and to beg for the Vacate to be lifted. Meanwhile my wife and I are staying on the couches of friends, who have graciously offered us space to sleep. The New York Times covered this story on October 20th, but we need more press in order for elected officials to help us. 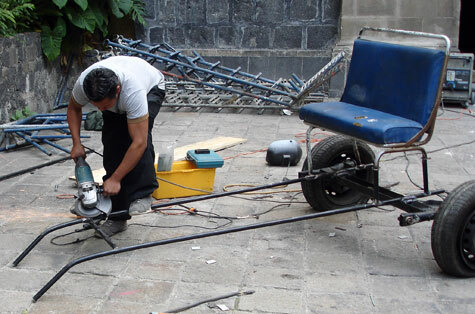 Arcangel Constantini has modified an old Mexican urban sport – “el toque” or touch – a late night practice of electrocution in order to continue drinking on festive nights. In some neighborhoods of Mexico City on Friday or Saturday nights, men walk around with a device that will give a customer an electric shock for 5 pesos. 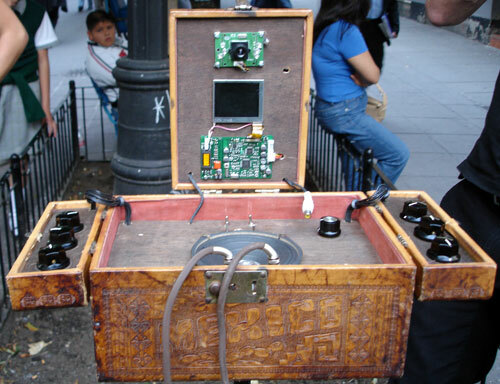 Arcangel has created his own device that beyond the means for electrocution also carries a video camera that captures the image of the participant while receiving electroshock as well as a speaker and a series of dials that allow Arcangel to modulate the level of electrocution and the sounds generated by the electricity. The touch is presented in a beautifully crafted box with very popular and traditional motifs. TRANSITIO commissioned a new work from me, so I proposed “Carreta Nagua, siglo XXI.” Prior to arriving in Mexico City, I created a 9 minute animation in which two television super heroes originally created in the mid to late 60 and widely seen in Latin America discuss the effects of globalization, immigration and personal loss due to cultural transitions. 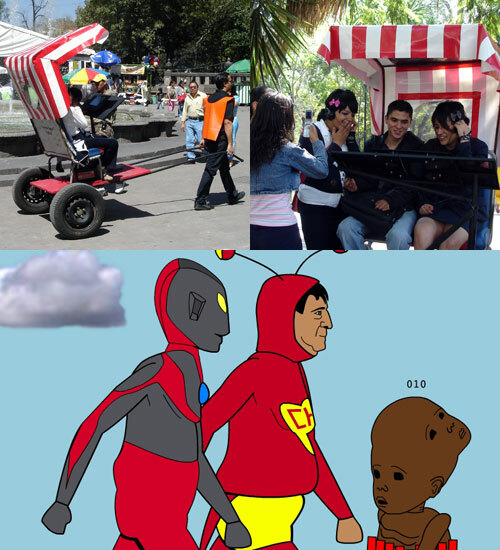 The two characters are Chapulin Colorado, the comic super hero of the long running TV show Chespirito and Ultraman, the Japanese intergalactic alien super hero. The narrative is based on my parent’s move back to Nicaragua after 45 years of living in San Francisco, CA. 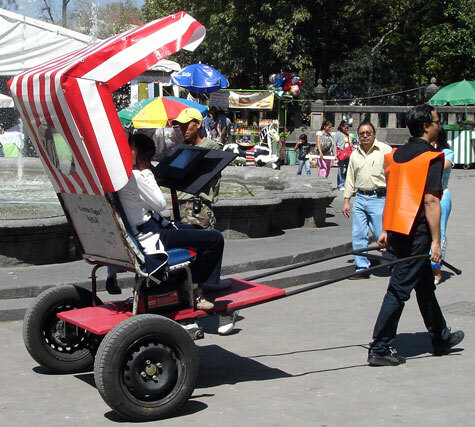 As a passenger takes a ride in the rickshaw through the colonial park, Alameda Central in Mexico City’s historical center they watch the animation. The title Carreta Nagua is co-opted from the Nicaraguan folk tale in which a haunted cart is pulled by two skeletal oxen and driven by death. If the cart arrives at your home someone is to die. The tale was established by the indigenous people of Nicaragua who during the colonial period they were taken by the Spaniards on cart to work the mines. These people died in the mines and only reappeared as corpses carried on these same carts. 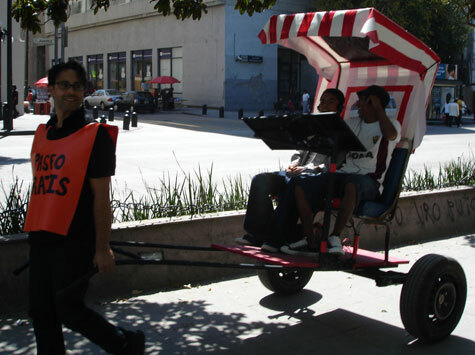 The cart became a symbol of death to the indigenous people. Kaffe Matthews famous for her sonic beds has constructed a sonic bench with an 8 channel sound system that travels through the bodies of those sitting upon the bench. From the bench eminates an excellent electronic composition that is relaxing while one’s body is massaged via the pulses of the speakers within the bench. 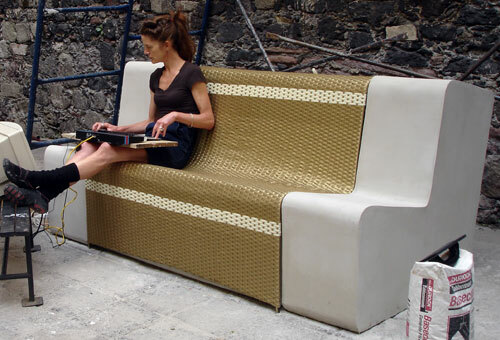 Kaffe views the bench as an instrument that she invites others to compose pieces for the sonic bench. 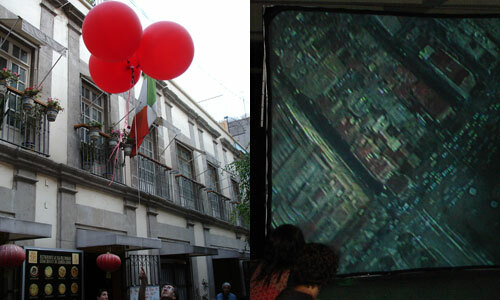 Gustavo Romano brought his “Pieza con globos Nro 2 y Nro3” to Mexico City in which large red balloons are released into the sky with a single channel video camera that captures the image of the city as the balloons fly away. The action was performed in the historic center next to a bar which screened the real-time image of the camera has it floated away. The piece is quite poetic as the people, streets, buildings and city grow smaller and smaller and yet more expansive. Floating Lab Collective set up video booths around town to record requests for protests as part of their “Protest on Demand” initiative. The protests collected in Mexico City were then enacted in Washington DC by participants and volunteers. 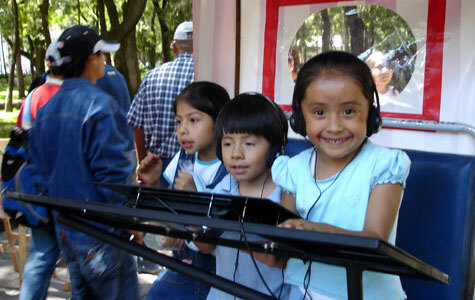 Fran Ilich set up an autonomous zone – “SubComandancia” in a trailer that was broadcasting via FM frequency and online as lectures, theater, discussions and panels were held within the space. Graffiti Research Lab did a workshop for the Free Synthesis curatorial project in which they painted and decorated and old school bus, made LED throwies and then in the evening beamed laser graffiti onto the side of an abandoned building across Alameda Central. Mario de Vega presents a machine that drops coins equivalent to the minimum wage of the various states of Mexico. As a conceptual premise, TRANSITIO seeks to question what is community, how is it constructed as a social concept and as physical reality. The museum Laboratorio Arte Alameda houses two curatorial projects Im_polis…(Place of Relation) curated by Ale de la Puente, Rogelio Sosa, Ivan Abreu and Karla Jasso and (dis)COOMmunities curated by Laboratorio 060 both are part of TRANSITIO. One other curatorial grouping Free Synthesis is primarily located at the Center of the Image. The three curatorial endeavors began nearly a year ago as Jose Luis Barrios lead a seminar that reconsidered the modes of art exhibition. As the seminar proceeded the participants formed curatorial groupings with varying perspectives and TRANSITIO began to take shape. 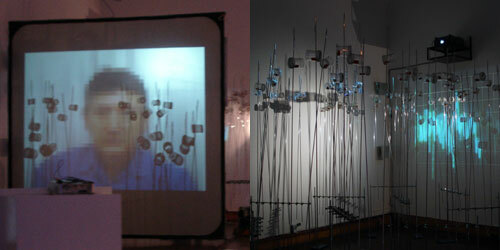 “Bright Future Ahead” (2006) by Jan Verbeek is a four-channel video installation in a white cube. 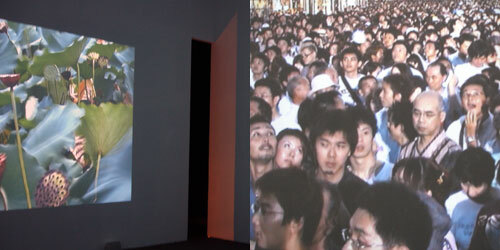 The videos have been shot in Japan and present sequences that toggle between nature and saturated urban spaces. The phrase “El Trabajo Embellece” (Labor Beautifies) by Jose Marti is superimposed upon the floor of the museum and a sander activated by museum visitors erases the phrase from the floor over time.Â This is a work by the Mexican artist Gilberto Esparza. 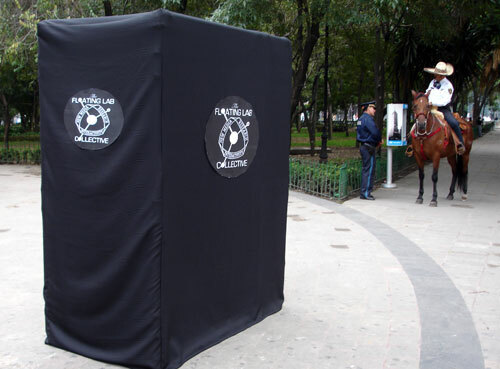 “Moving” (2007) Raquel Kogan is a black cube video installation. 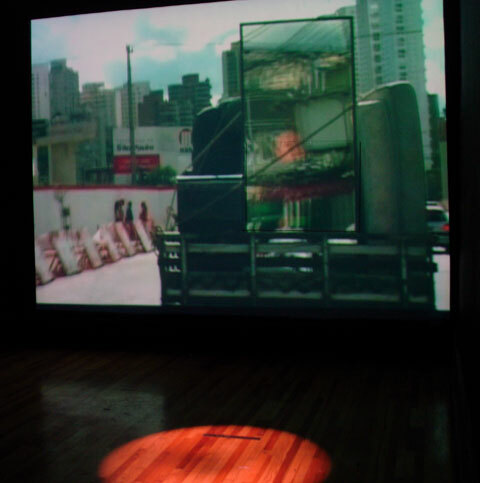 The video projected onto one wall follows an open air moving truck, filled with home goods – mattresses, a television, other furniture and at the very rear of the truck a mirror. The truck drives through the streets of Sao Paolo. A few feet before the mirror is a spot light intended for the viewer to step into and when one does, the viewer’s image appears on the mirror. 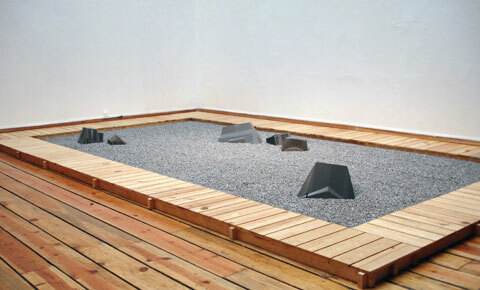 Jaime Ruiz Otis has created a Zen Garden in a traditional manner, but with non-traditional materials. He built a rake to lay down the design on to shredded silicon that composes the ground of the zen garden. amongst the gray ground of silicon are partly burried televisions. 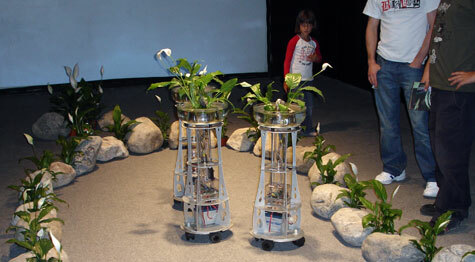 The zen garden presents a reflection of the waste generated by today’s popular technologies. 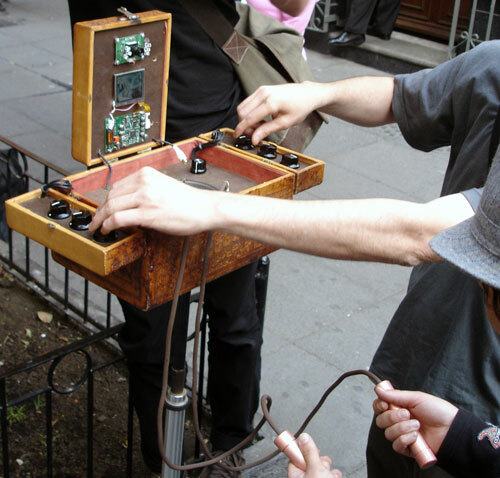 Australian sound artist and sculptor Nigel Helyer (a.k.a. Dr Sonique) has created a visually stricking installation in which a series of structures holding crickets are located between two projections, one that shows a pixelated video of a professor lecturing on crickets and the second a visualization of the audio as 200 crickets listen to the lecture.Â The installation is titled “Host” (2002). Toni Mestrovic has created a hypnotizing video loop with surround sound. 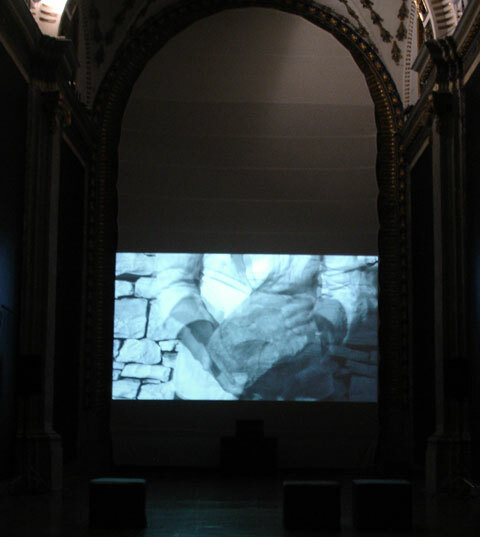 The video consists of three superimposed sequences of a man’s hands forming a stone that will be part of his home. The three video sequences have a slight time difference to create a layered effect, but for a moment, all three sequences converge to create one single video image. The hands belong to Toni’s father who is currently reconstructing his childhood home. It is a stone home built in an ancient manner, without mortar or cement. Each stone is shaped by his hands to be placed as part of the structure. The sound is not clearly defined, but it suggests the sound of the hands against the rock as it moves throughout the side naive’s interior. The designer and architect Jorge Perez designed an inflatable structure to serve as a hub for the various curated projects of (dis)COMmunities, since many of the projects are occurring on the street or between locations. The hub is also serving as a temporary meeting place for various organizations. Other works include a beautifully shot video of a businessman with a briefcase riding a bull and eventually loosing all his documents as the briefcase flies open by Gonzalo Lebrija.Â A sound installation titled “The Sound of Mercado Libre” by Ubermorgen.com.Â A gorgeous video that only presents information – adds, billboards, icons, street signals in the streets of a European city, all else is black.Â The work is titled “Kapitaal” by Studio Smack. Friday October 12th was the big kick off for TRANSITIO_MX02, International Festival of Electronic Arts and Video taking place throughout Mexico City. 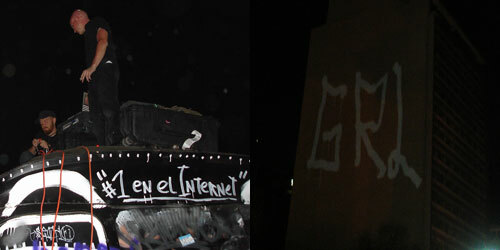 Comprised of three curatorial projects – Free Synthesis, (dis)COMmunities and IM-POLIS, an open call competition, electronic music concerts, artist workshops and a conference, the festival is taking place at three locations: the National Center for the Arts (CENART), Laboratorio Arte-Alameda and Centro de la Imagen. The initial opening and concert was at CENART which is housing the exhibition of finalists from the open call for the TRANSITIO prize. Many of the finalists were represented by video documentation such as Usman Haque’s “Open Burble.” There was a beautifully shot three panel video projection by Erik Olofsen titled “Drives”. 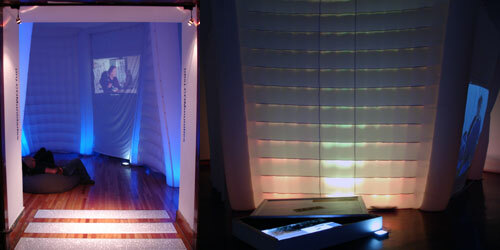 Below are a few projects installed in the Art Center’s gallery. My favorite project which is visually striking, conceptually intriguing and offers free packaged Mexican dirt is “Tierra y Libertad” (Earth and Liberty) (2007) by Ivan Puig based in Mexico. 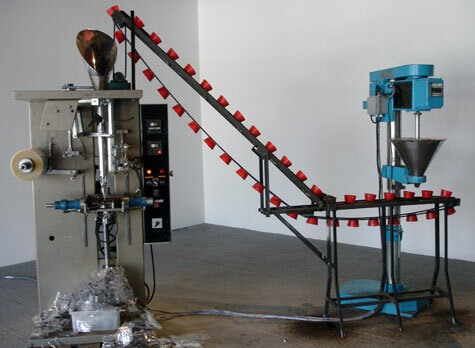 Puig has constructed a machine that deposits dirt taken from the base of CENARTS into red plastic cups that are then deposited into plastic bags that are sealed and stamped for the visitors to take. SARoskop (2007) by Karin Lingnau and Martin Hesselmeier based in Cologne visualizes the electromagnetic waves in the immediate area. 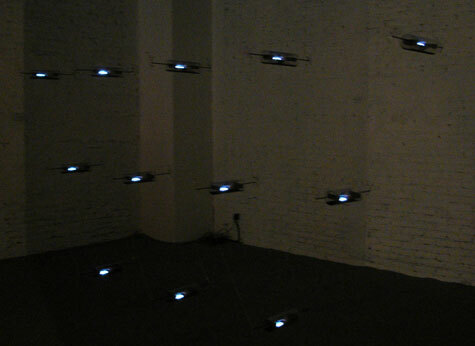 If one uses their cell phone near the grid-like installation SARoskop, the objects come alive, moving horizontally on a rail that each component is mounted on and displaying the frequency of the call. 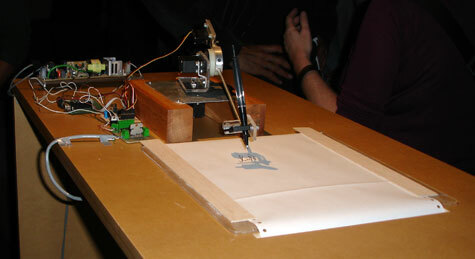 A second physical computing project installed at the exhibition is VEHICLE (2007) by Gerardo GarcÃ­a de la Garza, a robotic arm that duplicates Joseph Beuys signature triggered by visitors who approach the work. Visitors are free to take a signed sheet. Separate from the finalists’ exhibition, in its own gallery at CENART is installed Ken Rinaldo’s “Augmented Fish Reality”, a well travelled installation in which Siamese Fighting fish drive the robotic pedestals that the bowls sit on. TRANSITIO continues through October 20th, over the next week I’ll continue to document other pieces of this giant festival, including the keynote presentation by Gunalan Nadarajan, the curated exhibitions and as many of the panels that I can attend while executing my own commission in the park Alameda Central. El Parque Alameda Central is filled with people on Sundays.Â Musicians, merchants, families, tourists and this Sunday was a beautiful clear day, perfect for a nice tour through the park on a rickshaw.Â Most people questioned the fact that the ride would be free, but once a few people were convinced many more waited to be taken for a ride and watch the animation.Â People seemed to enjoy the animated narrative that featured El Chapulin Colorado and Ultraman discussing personal changes due to migration. 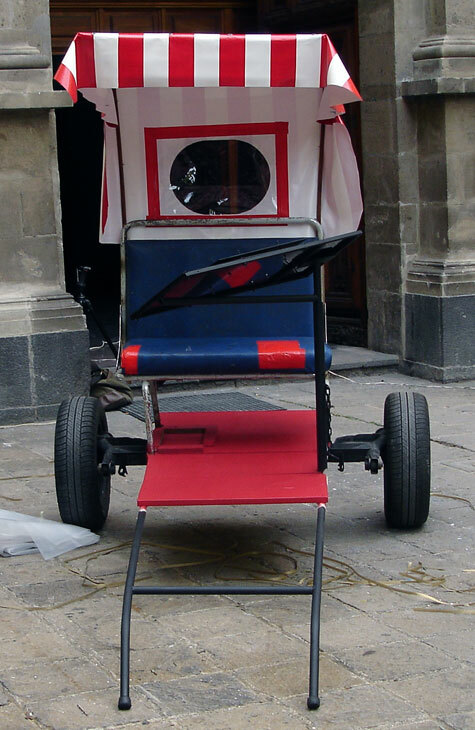 The cart is finalized with rooftop, panel for the display, painted and ready to take people on tours of the park. Putting the final pieces of the frame work of the cart, before painting and adding all the details. I had a young crew of three boys to help me assemble the cart through the weekend. Saturday morning I took a trip with their boss, a Spaniard named Hector who runs a fabrication company that primarily does exhibition production for large media companies such as Sony, but prefers to do production for cultural institutions, they just don’t pay the bills. We drove to his shop with a couple of his employees to gather tools and materials. Returned to Laboratorio Arte-Alameda and immediately got to work. It was a late start and I only had the three guys that day and Sunday. 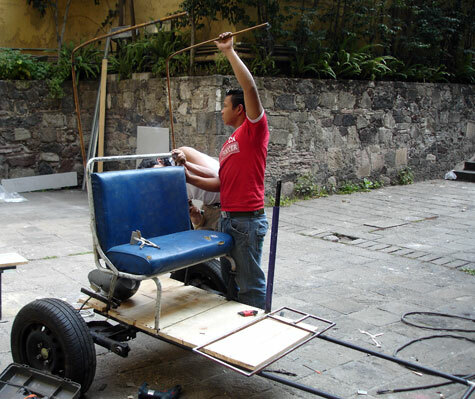 By the late afternoon the cart began to take shape. We completed the basic structure, installed the bus chair and resolved a few questions. In the early evening it began to poor so we stopped to continue on Sunday. Discussing the joining of the axle to the steel tubes that would make the primary structure.